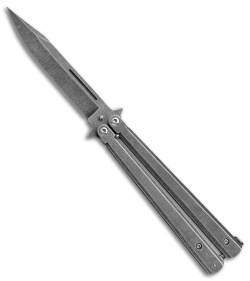 Sandstorm Gray Butterfly Knife. Features a slick tactical design that flips like a dream. Its darkwash finished stainless steel blade has a sharp edge with a clip point for easy precision cuts and piercing. The handle is comfortable in hand and well balanced for flipping. This balisong is equipped with a stainless steel pocket clip and a spring-loaded latch for secure carry and storage.